Lucknow, the capital of Uttar Pradesh, is not the most popular city of the state. Travelers usually prefer the mystic Varanasi or Agra and its famous Taj Mahal. Yet, what a wonderful surprise! 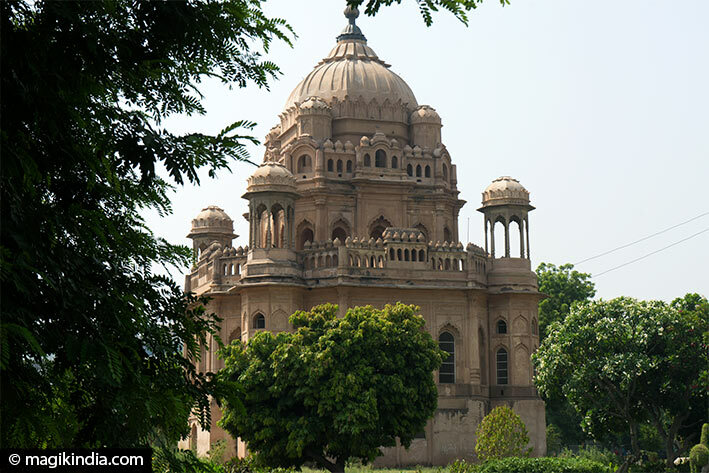 Lucknow amazes us with the splendor and refinement of its historic buildings. 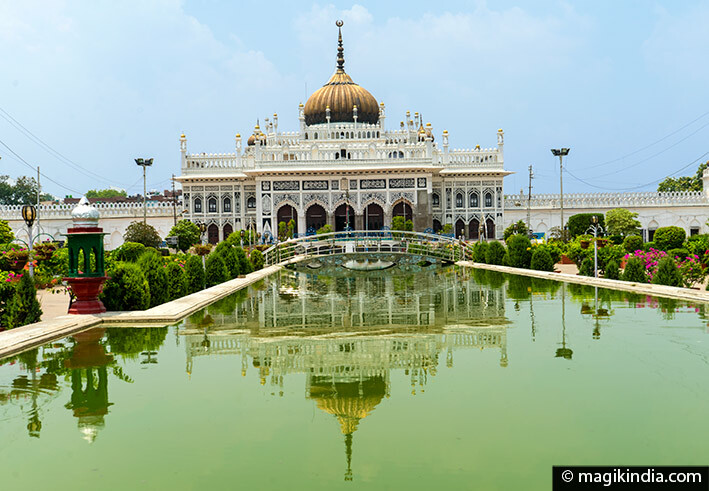 From the 18th to the 19th century, it was the capital of the Nawabs, extravagant rulers and lovers of the arts, who contributed greatly to the city’s cultural richness by developing dance, music and poetry while building many unique monuments in India. 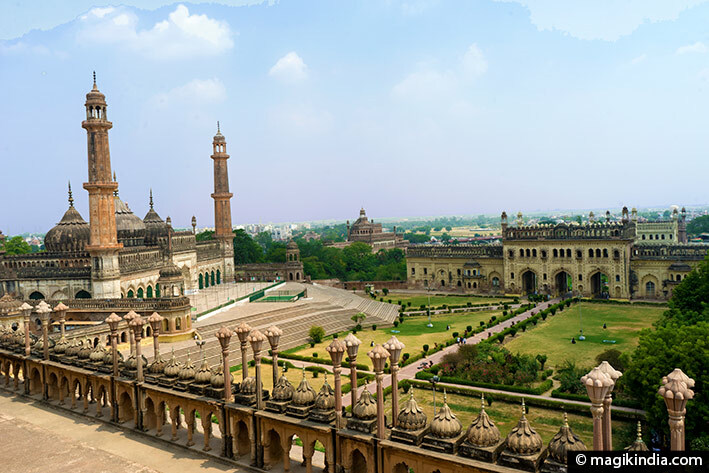 Legend has it that the city of Lucknow was founded by Lakshmana, the brother of Lord Rama. Actually, the most famous history of the city is quite recent and took place in the days of the Nawabs, sovereign and administrators of the province of Awadh (or Oudh), which more or less corresponds to present-day Uttar Pradesh. The term ‘Nawab’ comes from the Persian ‘nuwwab’, which means emir or deputy. This title was given to the Indian rulers of Muslim faith. The founder of the Awadh dynasty was a Persian aristocrat named Burhan-ul-Mulk Muhammad Ameen, who arrived in India in 1705 and quickly won the favors of the Mughal Emperor Muhammad Shah. In 1722, when the Mughal Empire was crumbling, Muhammad Shah appointed Burhan-ul-Mulk Muhammad Ameen as governor of the Awadh. It was the beginning of a period of more than 100 years (from 1732 to 1856) the ‘Nawabs’ rule. 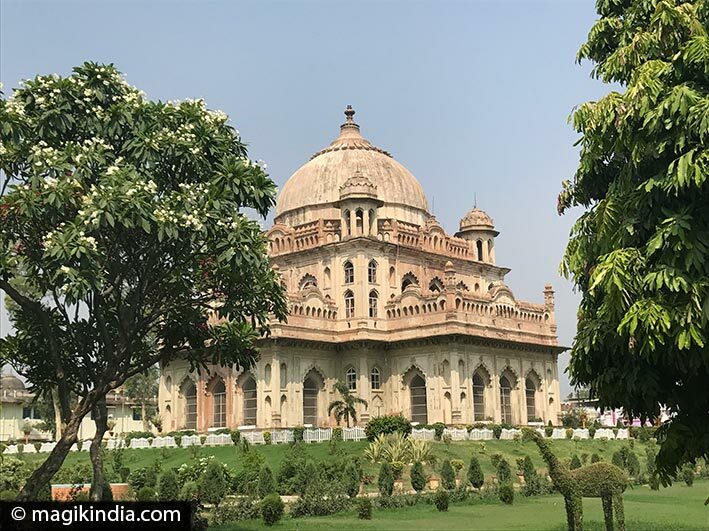 When in 1755, under Nawab Asif-ud-Daula, the capital of Awadh is moved from Faizabad to Lucknow, the town enters its golden age and takes its independence from the Mughal Empire. 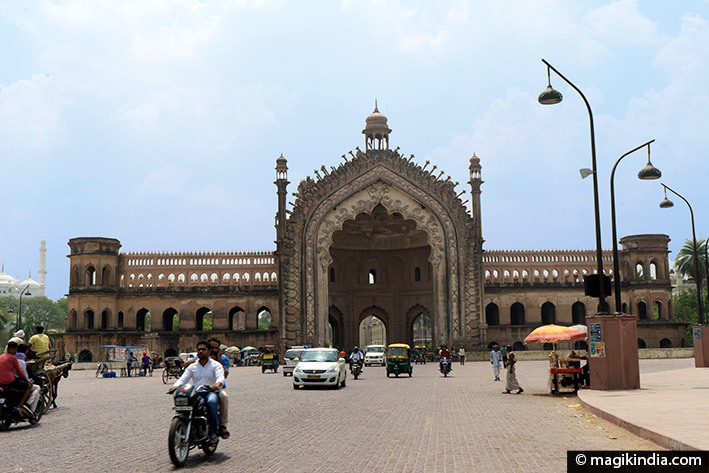 Under the British Raj, Lucknow will become an administrative capital and the capital of Uttar Pradesh after the Independence of India in 194. 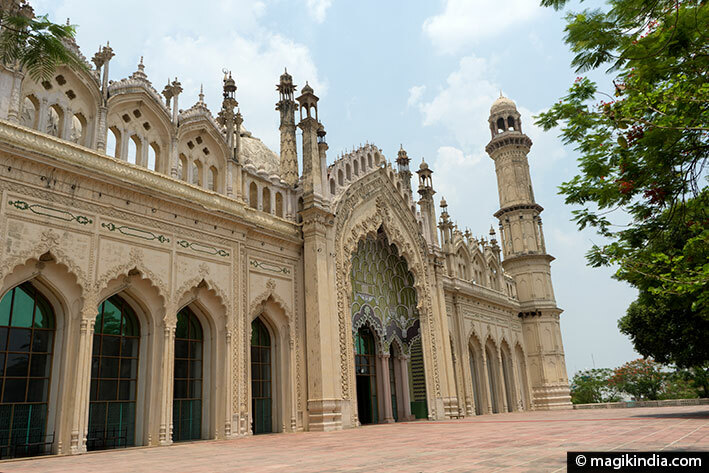 The ‘Bara Imambara’ (the big Imambara) is one of the most visited buildings in Lucknow. An ‘Imambara’ is a place where Shia Muslims hold functions, especially the one of ‘Muharram’, which commemorates the martyrdom of Imam Hussain, the grandson of Mahomet and the third imam of the Shias. The construction of the Bara Imambara was launched in 1785 by Nawab Asaf-ud-Daula, while the region faced devastating famine. One of the goals of the Nawab was to provide work for the people for several years. The Imambara was completed in 1791 at great expense, the interior decoration changed each year was equally costly. 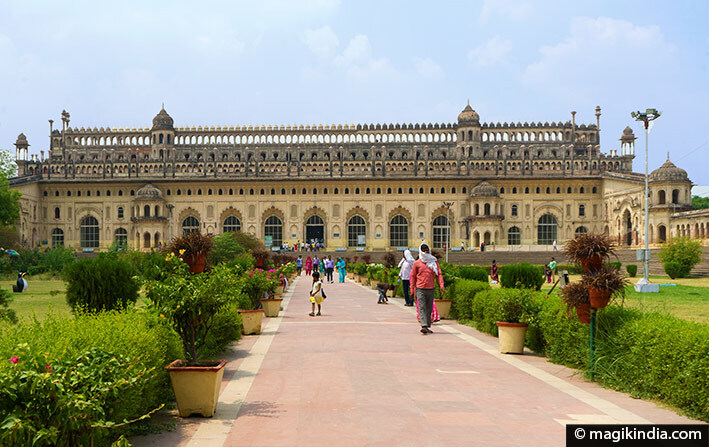 The Bara Imambara is a significant example of the Mughal architecture with high arches and a vaulted hall, which is said to be one of the largest in the world (50 meters long by 15 meters high). 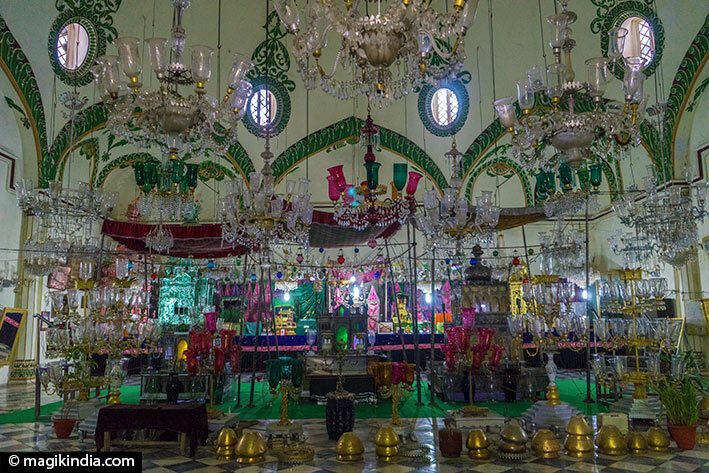 It houses the tomb of Asaf-ud-Daula and displays several ‘tazias’ or replicas of the tomb of Imam Hussain Ali (Iraq) in various materials, which are carried in procession during Muharram. 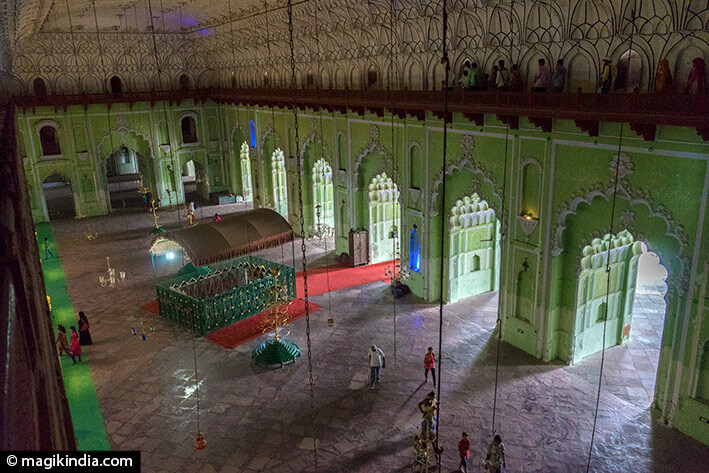 The originality of the Bara Imamabara lies in its labyrinth called ‘Bhulbhulaya’ located above and around the hall on different heights. 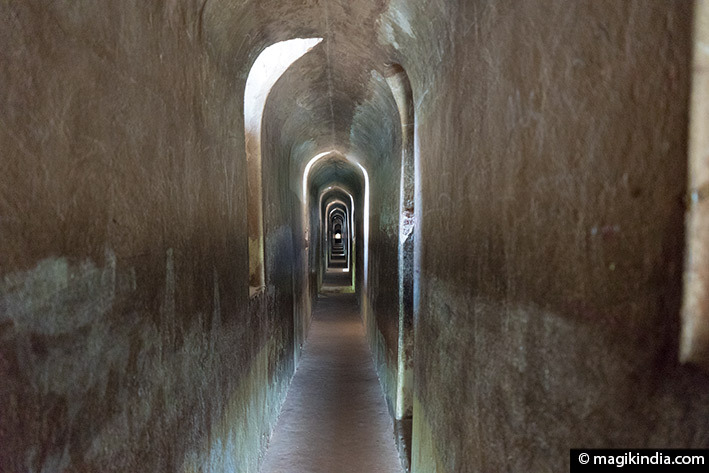 It comprises several rooms and nearly 500 interconnected passages. It is advised to be accompanied by a guide! 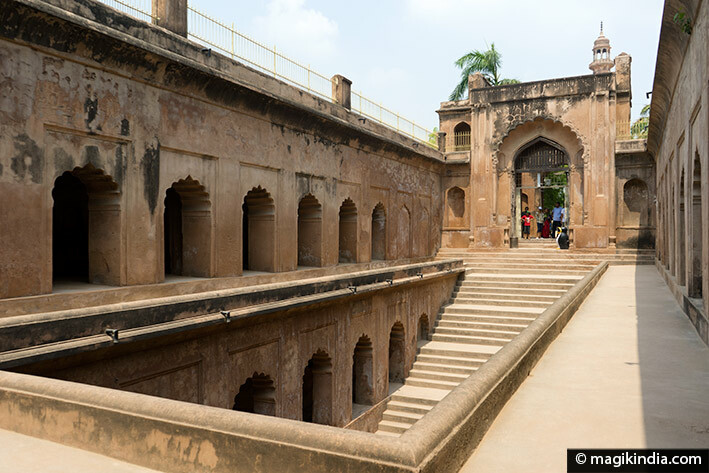 To the right of the Imamabara, one enters the ‘shahi baoli’, a large multi-storey well, surrounded by arches and galleries, which served as a water tank but also as a place of retreat and festivities during the summer season. Just opposite the baoli, one can see the elegant three-domes Asafi mosque (non-Muslims are not allowed). It was built before the Imambara by the Iranian architect Kifait-Ullah of Delhi, who is also the designer of the Imambara and Baoli. To the right of the Bara Imambara, we pass under the porch of Rumi (Rumi Darwaza). 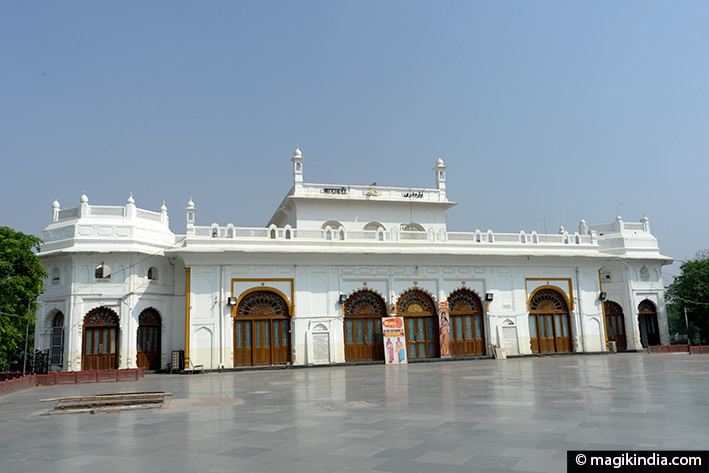 It is also one of the most famous buildings of Lucknow built in 1784 by Asaf-ud-Daula. Its architecture was inspired by the ‘Bab-i-Humayun’, an ancient gate located in Istanbul (Turkey), hence its nickname of ‘Turkish gate’. In the days of the Nawabs, an immense lantern illuminated the structure at night and small fountains spouted of the flower buds carved around the arch. Just after the Rumi Darwaza stands the Husainabad clock tower. 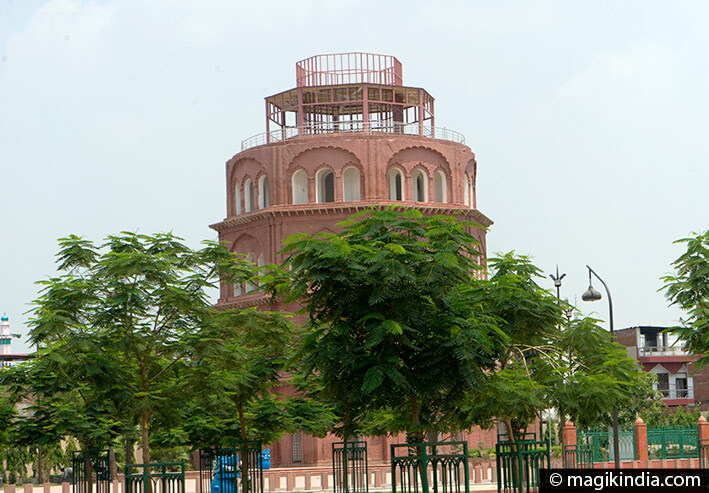 This tower of nearly 70 meters was built by Nawab Nasir-ud-Din Haider in 1880. 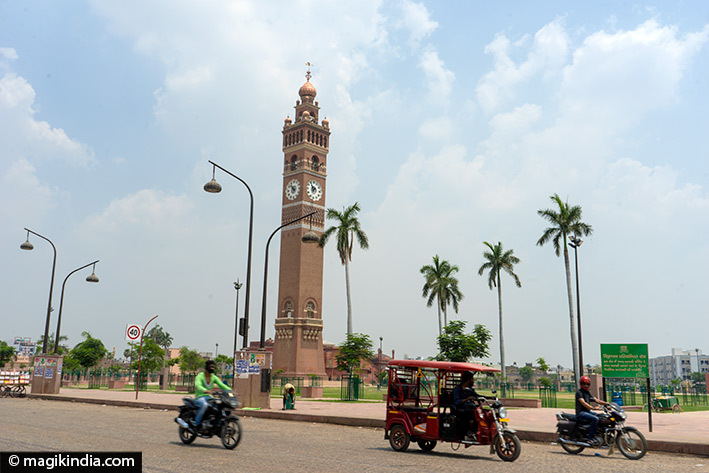 It is said to be the tallest clock tower in India. 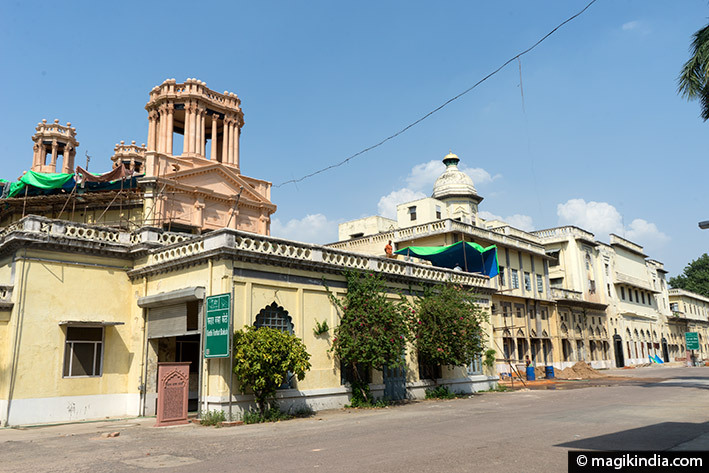 Right next to the clock tower is the ‘Hussainabad Picture Gallery’, one of the oldest photo galleries in Lucknow. The gallery was built in 1838 by Mohammad Ali Shah, the third Nawab of Awadh, and was used as a summer residence by the royal family. It also includes a pond and a mosque. To the left of the gallery stands the Satkhanda, an 11-meter red watchtower built by King Mohammed Ali Shah in 1837 in a style that blends Greek and Mughal architecture. It is said that the designers were inspired by the leaning Tower of Pisa. The word ‘Satkhanda’ means ‘seven floors’, but as the construction was abandoned along the way following the death of the Nawab, the tower has only four floors. A few meters after the porch of Rumi, another beautiful building is revealed: the Chhota Imambara (small Imambara) or Imambara of Hussainabad. 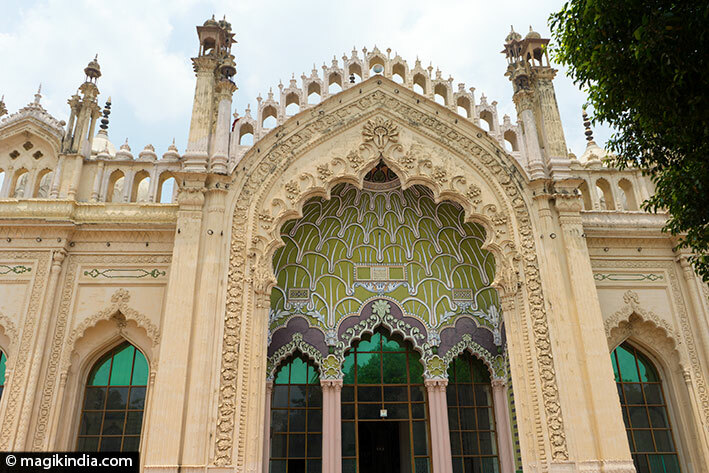 The Imambara was designed by Nawab Mohammed Ali Shah in 1839 and serves as a mausoleum for the Nawab himself and other members of his family. It is composed of two halls containing the silver throne and the red crown of Ali Shah and are richly decorated with beautiful chandeliers imported from Belgium, from which it got the name of ‘Palace of Lights’. The exterior is equally refined, adorned with verses from the Koran. 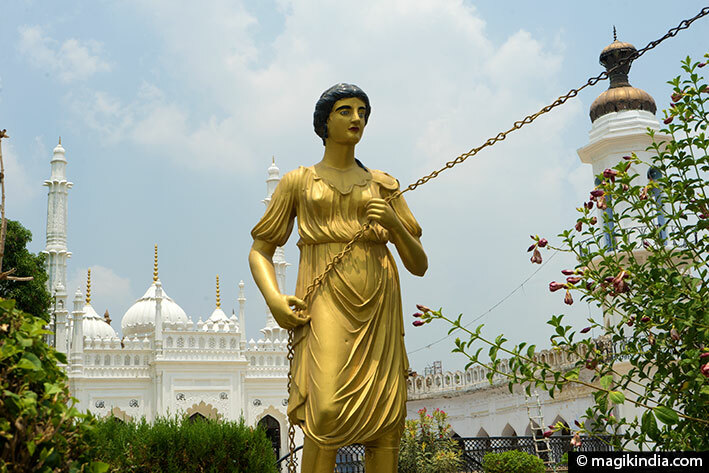 The Imambara complex also includes a hammam for ablutions before prayer, a ‘jawab’ (a building that ensures the architectural symmetry of the place), a small replica of the Taj Mahal, and two golden statues of women wearing a curious metal chain that actually serves as a lightning rod for the complex. Leaving Chhota Imbambara and continuing straight to the north, one discovers the bubbling Old Chowk, the old market of Lucknow, famous for its street food: kebabs and mutton biryani rice but also the famous ‘Malai makhan’ (a sweet cream snack, a specialty from Lucknow) and ‘thandai’, an almond and spicy drink. The Jama Masjid Mosque is a 5-minute walk from the Chhota Imambara, and it is one of the most beautiful mosques in India. Non-Muslims can not get inside but the outside itself is worth a look. Nawab Ahmed Shah built this mosque in 1423 (his tomb is inside it), entirely in yellow sandstone. Its arches combine Hindu and Mughal styles and are finely carved and decorated with floral motifs. The entrance arch, in particular, is a delight. 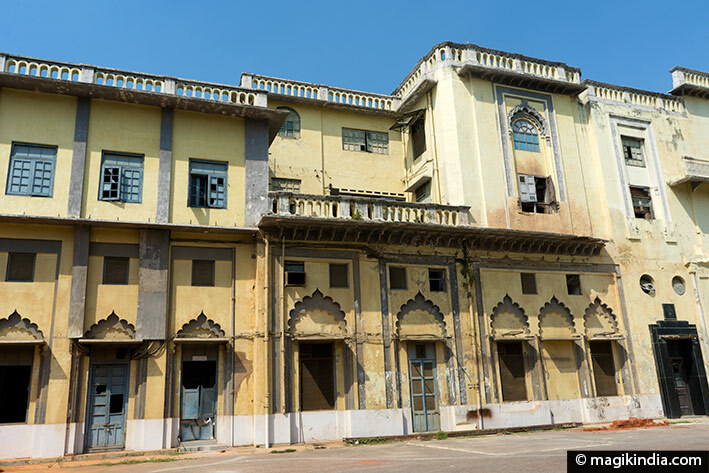 The British Residency was a vast residential complex, now in ruins, initiated by Nawab Asaf-ud-Daula in 1755 to host the British residents and their staff and it was completed in 1800 by Nawab Saadat Ali Khan. The British Residency served as a refuge for 147 days to nearly 3000 British people during the first revolt for India’s independence, in 1857. In the center of the complex is a museum that serves as a memorial and reviews the history leading up to the first revolt against the British invader. There is a model of the British Residency as it was prior to its destruction and many portraits of Nawabs and Rani of Jhansi (Lakshmibai). 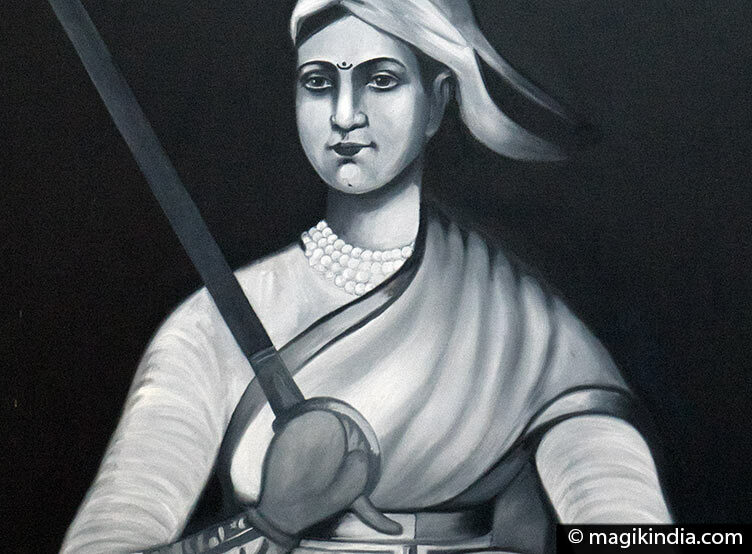 Lakshmibai was the queen of the princely state of Jhansi and became one of the leading figures of the Indian rebellion of 1857. 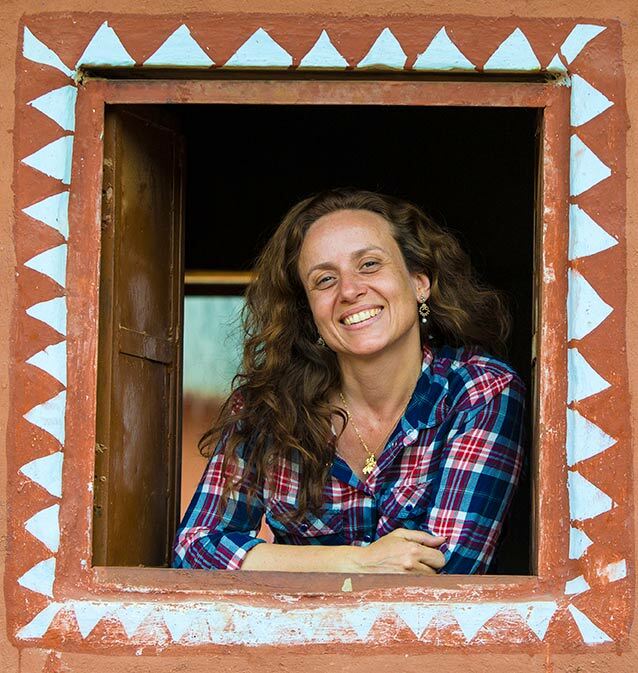 She became a symbol of resistance against the British Raj. Less touristy, these twin tombs near Begum Hazrat Mahal park are as worthwhile as the famous Lucknow monuments. The first elegant tomb is that of Khurshid Zadi or Mushir Zadi and was built by the Nawab Ghazi-ud-din Haider for his mother Mushir Zadi, wife of Nawab Saadat Ali Khan. The second tomb is where Saadat Ali Khan is buried, the husband of Mushir Zadi who reigned from 1798 to 1814. 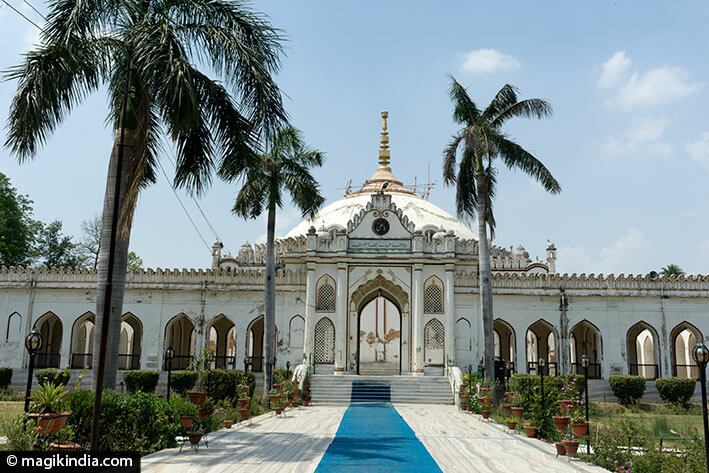 Near the Sikandar Bagh, there is another Imambara, a real jewel, which serves as a mausoleum for the Nawab Ghazi-ud-Din Haider (1814-1827), who has ordered the building, as well as his wives. It features a sober but elegant exterior architecture modeled on that of Hazrat Ali in Najaf (Iraq). 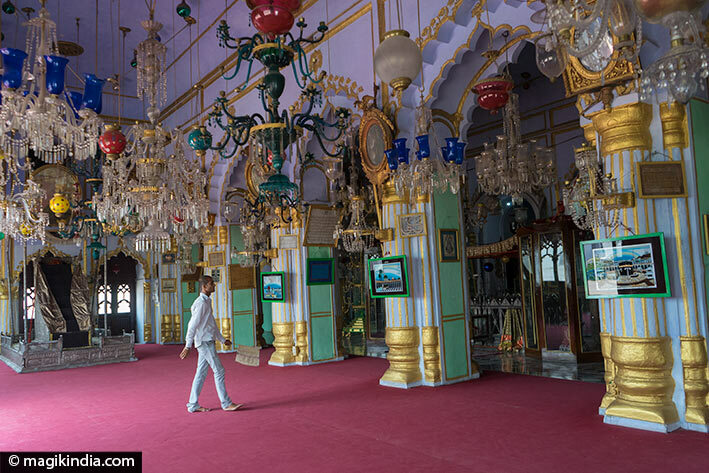 The interior, on the other hand, gives us the impression of entering a treasure room: large crystal chandeliers from Belgium, gold and silver tombs, green arabesques on the walls and wooden and bamboo tazias carried during the Muharram festival. 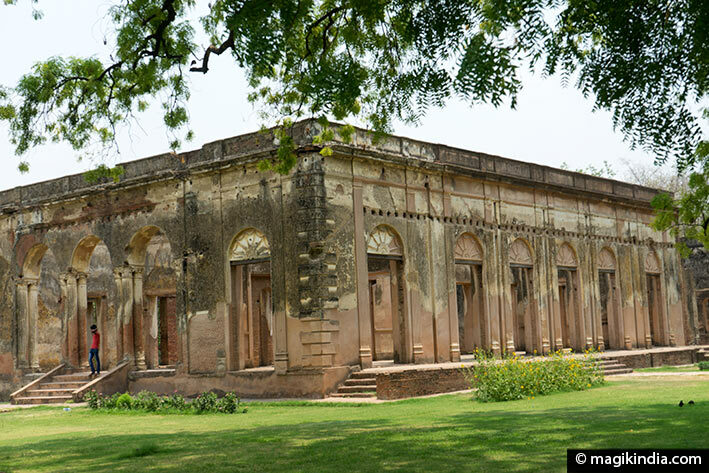 The palace of Dilkusha, heavily damaged by the revolt of 1857, was originally a hunting lodge and a summer residence used by the Nawabs. This English baroque style building was built in 1800 by British major Gore Ouseley, a friend of Nawab Saadat Ali Khan. Later, a cottage in Indo-European style was added by Nawab Nasir-ud-Din Haider next to the main building. He is in ruins now. 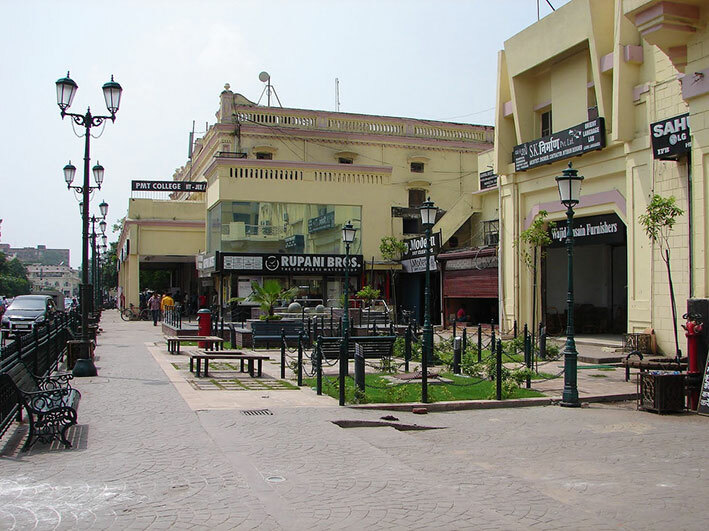 Hazratganj is one of the most popular places for shopping and entertainment (restaurants, chic boutiques, cinema and mall). The first bazaar was created in 1827 by the Nawab Nasruddin Haider, introducing food and products from various Asian and European countries. 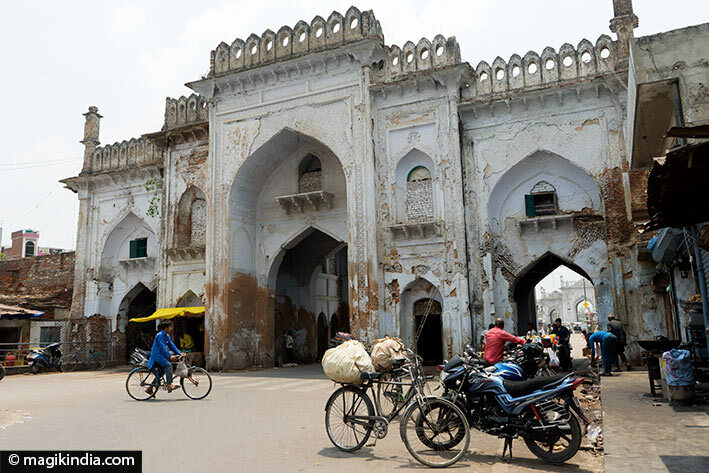 In 1842, the bazaar took the name of ‘Hazratganj’ after the Nawab Amjad Ali Shah who was also known as Hazrat. During the British Raj, in the middle of the 19th century, the bazaar was remodeled according to Victorian architecture; The old buildings of the original Mughal bazaar were demolished. 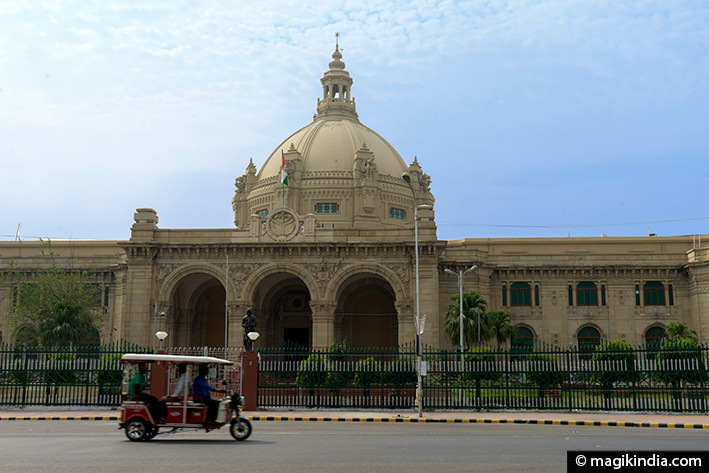 Just before Hazratganj, one can see the Vidhan Bhawan, the legislative assembly of Uttar Pradesh built in 1922 under the British rule, which shows an interesting Indo-European architecture. La Martinière College is a prestigious university for girls and boys founded in 1845 by Major General Claude Martin, an officer of the French army and then of the East India Company. The general made his fortune by serving the Nawab Asaf-ud-Daula; It is said that, at that time, he was one of the most wealthy men in India. Two other universities have been established according to this model: in Kolkata (West Bengal) and in Lyon (France). The goal of Major General Claude Martin was to provide education to all, regardless of the caste, the religion or the nationality of the students. However, because of a strong racial segregation led by the British, the Indians will not be admitted until 1935. 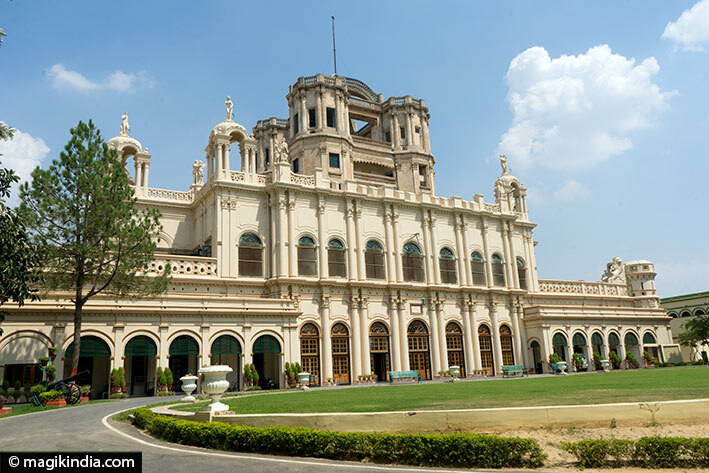 La Martinière College is a visit not to be missed in Lucknow. 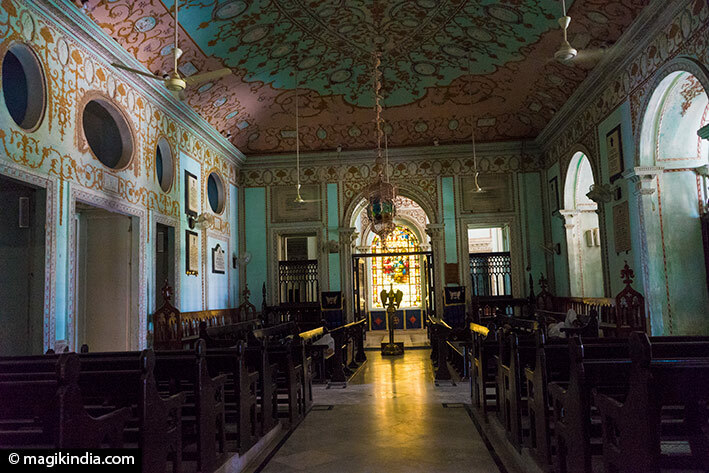 The building has a beautiful colonial architecture, one of the best preserved in the city. The interiors are equally interesting. Among them is the beautiful ‘Blue Room’ (formerly a reception room) decorated with beautiful stained-glass windows, a library, a trophy room, and an old classroom with wooden desks and inkwells. The Ambedkar park is a gigantic space stretching over several hectares. 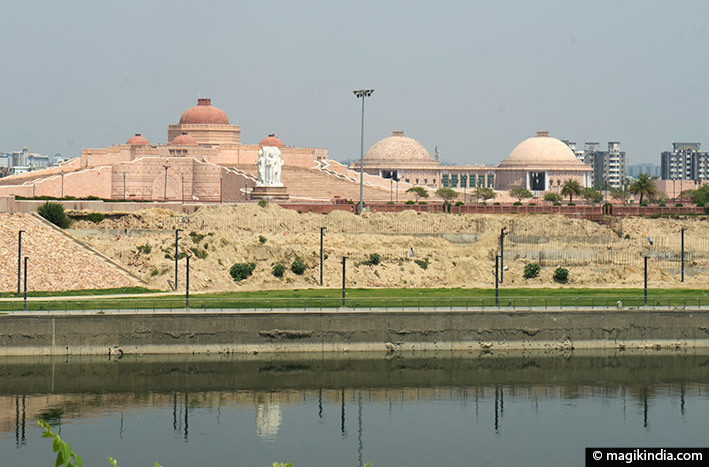 It was initiated in 1995 by Mayawati, the chief minister of Uttar Pradesh and inaugurated in 2008. 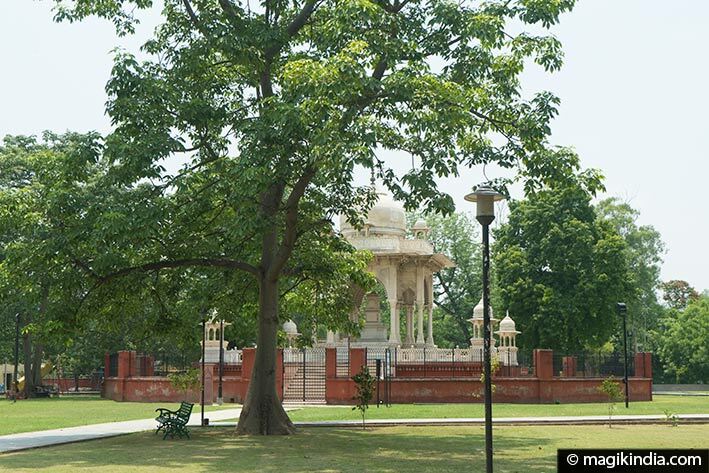 This park built entirely in red sandstone from Rajasthan at great expense, serves as a memorial to several personalities who dedicated their lives for the good of humanity. One of them, Bhimrao Ramji Ambedkar (1891 -1956) – who gave his name to the park – was an Indian lawyer, politician and social reformer who campaigned against social discrimination (against the caste system in particular) and promoted women’s rights. He was appointed Minister of Justice and was the main architect of the Constitution of India. 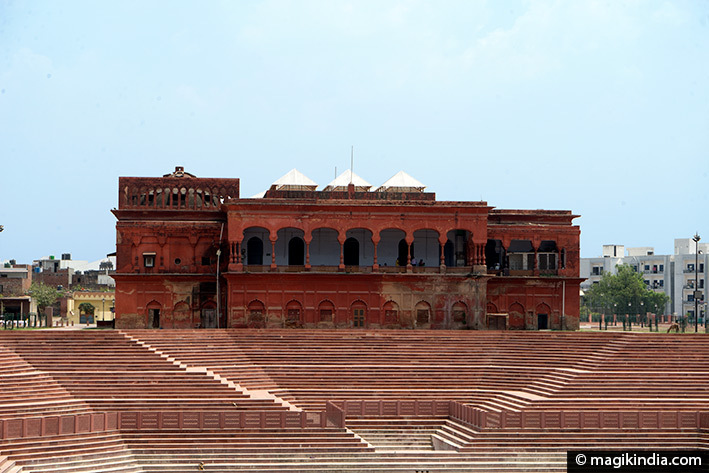 The Chattar Manzil (umbrella palace) is one of the other imposing structures built by the Nawabs of Lucknow. The palace, which takes its name from its domes in the form of an umbrella (chattri means umbrella in Hindi) served as a royal residence to the Nawabs. Nawab Ghazi-ud-Din Haider began its construction completed by his son Nasir-ud-Din Haider. Then, the English put a touch of European architecture there. 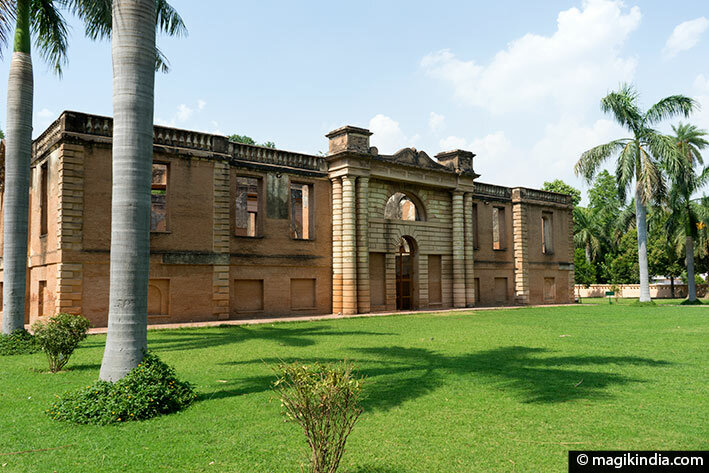 The Chattar Manzil, which housed the Central Drug Research Institute (CDRI) is currently being renovated (in June 2017 when I went there); The gouvenment plans to create two museums and a library there. Right next to the umbrella palace is the Kothi Hayat Baksh. Nawab Saadat Ali Khan was fascinated by European architecture, and he asked Major General Claude Martin to design a residence. 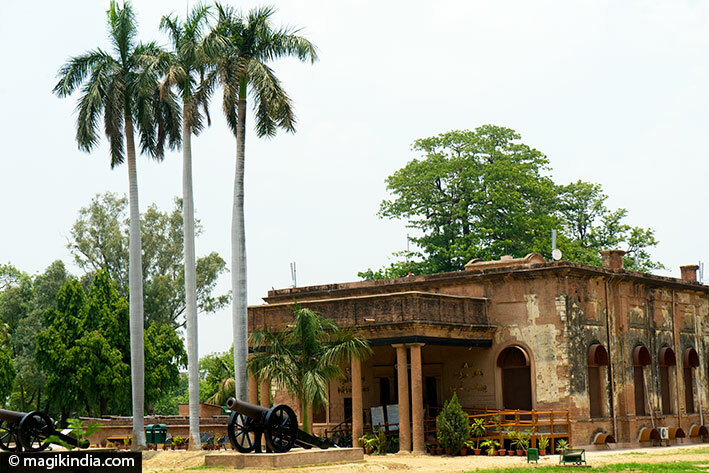 The Nawab never lived there and the splendid Kothi Hayat Baksh became the main residence of Major General Claude Martin. Just like the Chattar Manzil, it is undergoing renovation. Built in the southeast of the Chattar Manzil, the Kaiserbagh complex was an architectural project led by Nawab Wajid Ali Shah from 1848 to 1850. The complex comprises three buildings, now in ruins (women’s quarters), on three sides of the ‘ Baradari ‘, a white building once covered with silver. The architecture blends European and Mughal styles. It now serves as a showroom. Begum Hazrat Mahal (1820 – 1879) was the second wife of Nawab Wajid Ali Shah. While her husband had exiled to Kolkata, she took over the business of the state and rebelled against the British; She was finally forced into exile in Nepal in 1879. A pavilion in the park is dedicated to her. 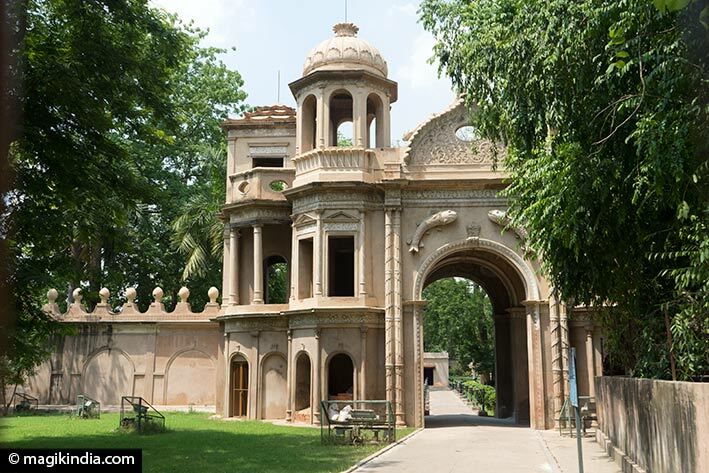 Sikandar Bagh, is one of the other historical gardens of the city. Nawab Saadat Ali Khan made it a royal garden at the beginning of the 19th century and the last Nawab, Wajid Ali Shah (1822-1887) built his summer residence there. All that remains of its history is the beautiful porch adorned with the “pair of fish”, emblem of the Nawabs. Why the pair of fish as the emblem of the Nawabs? Fish is a well-known symbol in Persia, from where descend the Nawabs. It symbolizes bravery and strength. The story goes that the first Nawab, Saadat Khan Burhan-ul-Mulk, was sailing on the Ganges, the most sacred river in India, when two fishes jumped on his knees. 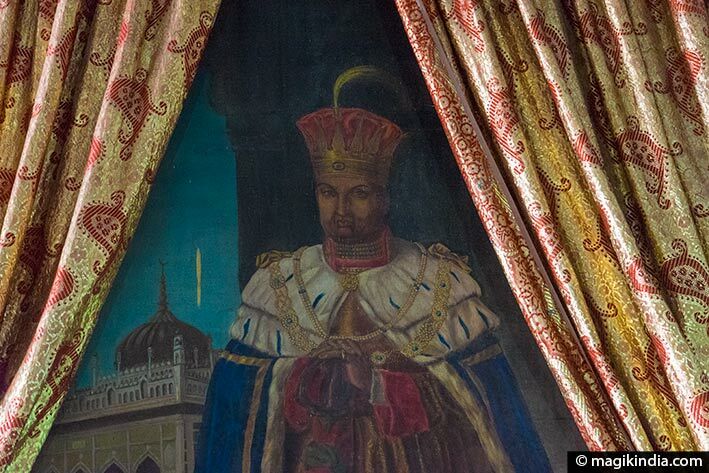 As Saadat Khan Burhan-ul-Mulk had just been appointed governor of the Awadh region, he took it as a sign of good omen and decided to make it the emblems of the golden dynasty of the Nawabs.